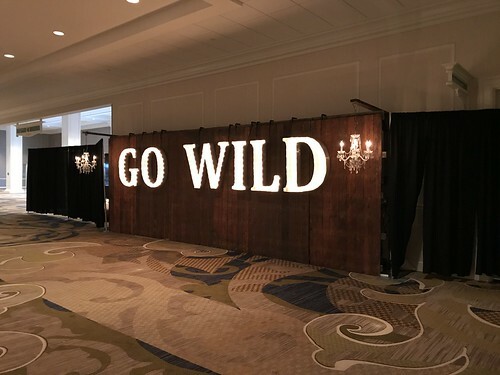 Thursday evening is when Go Wild officially began with Registration starting at 6 pm, and the Happy Planner Happy Hour starting at 7 pm at The Big Bang Dueling Piano Bar in Downtown Nashville (about 20 minutes away). After cleaning up at the hotel, I decided to wander down to Ryman to see if they needed any help. I wasn’t scheduled, but if I could help, I’d like to. Most everything was finished in Ryman, so Betsy sent me up to Delta Ballroom A (where the conference was to be held) to see if anyone needed help up there. Just inside the lobby to Delta Ballroom A. I was careful to not take any Top Secret photos. Don’t want to ruin the surprise for anyone on accident! It took 30 minutes and a couple miles, but I made it to the ballroom (I kid, but I can’t stress enough how big this place was!). There were only a few people in there decorating tables and some people setting up the Michael’s displays. No one needed any help at that time, and I didn’t want to be in the way, so I went back to Ryman. I took over blowing up some beach balls from Julie, then Marci needed a ride to The Big Bang to decorate the bar. Jennifer Jones-Oliver, Marci Wagner, and I headed to downtown Nashville. It had started raining a little, so the roads had a slick on them. There was also a very steep section of road by the parking garage. I had to hold the brake until the last second when taking off from a stop so that I wouldn’t slide backwards into the car behind me. Once, the tires took a second to gain traction. 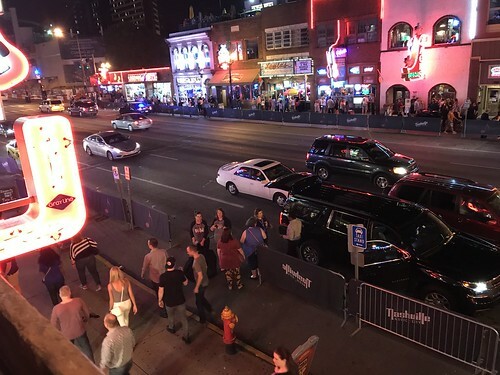 OMG, Nashville! Are you trying to kill us? The parking garage entrance also wasn’t very intuitive (looked at first like a private entrance, so I passed it). I backed up most of the length of the alleyway to get back to the entrance, as Jennifer put it, “Like a real New Yorker!” Damn skippy! 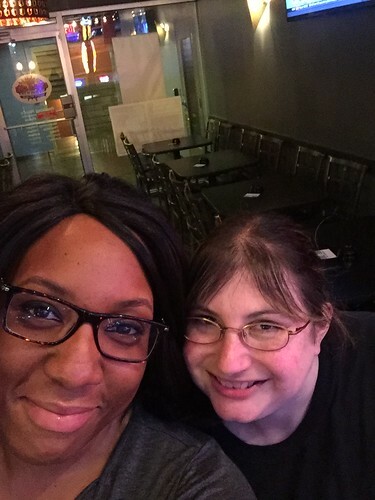 Jennifer and I at set-up! I love her so much! Kristin Damian of Krissyanne Designs had made decals for the bar, so we put these up on the mirror that ran the length of the stage, on the pianos, and even on the front of the bass drum! 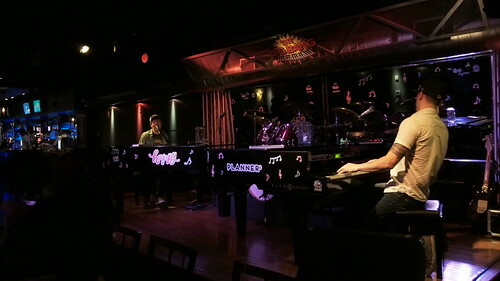 We put slips on the tables so people could request songs from the pianists, as well as slips for them to enter a giveaway from Happy Planner. 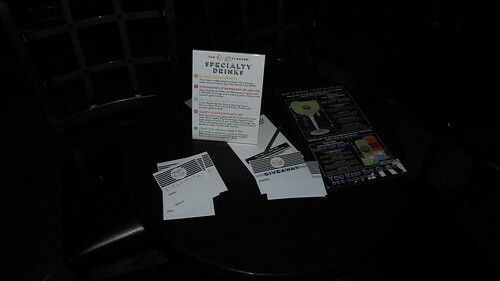 We set out custom Happy Planner napkins on the tables and at the two bars, and put the special drink menus into frames, scattered throughout. Drink menus. I tried the Llama Lemon Drop and Stephanie’s Strawberry Splash. We finished just in the nick of time! Stephanie Fleming from Happy Planner and her group arrived just before 7 pm. 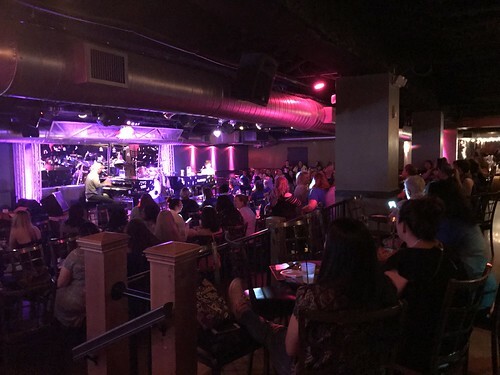 The pianists were hysterical and it was a great time! 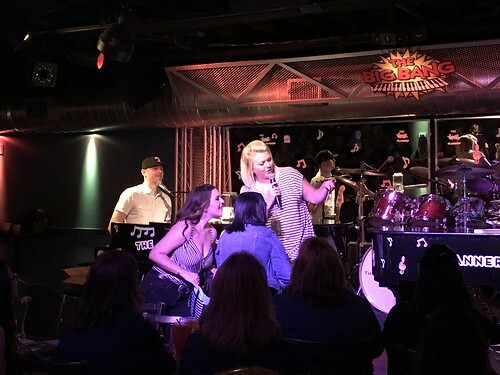 Everyone kept trying to get these guys to sing “girly” songs like Britney Spears and 90s music and they were both good sports and made it a very fun evening. 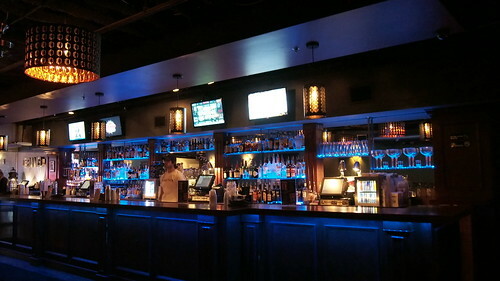 The Big Bang was located on the second floor, with a patio area overlooking the street. A great space to hang out and people-watch. 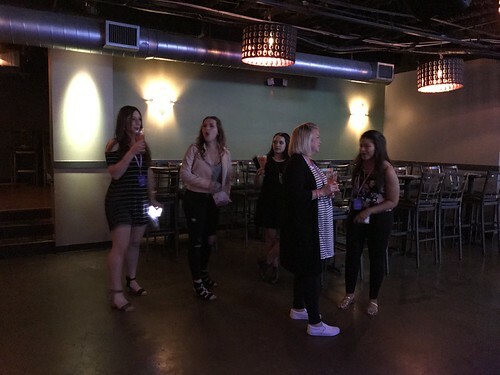 It didn’t fill up immediately, as people were still back at the hotel registering (and it was a 20 minute drive once you got an Uber/Lyft), but it really wasn’t too long before the bar was packed! You can’t see the whole place in one shot. There’s a front and a back bar and an extensive porch/patio/loft area. Marci and I had fun calling to arriving Llamas from the balcony! 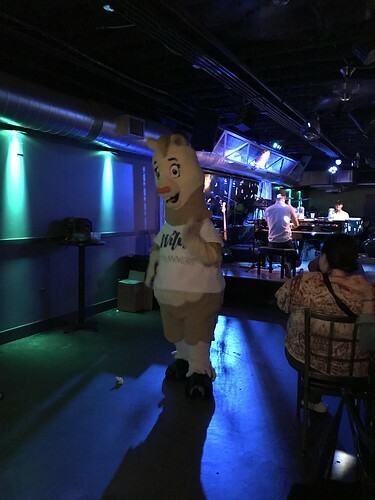 Even our Llama mascot made an appearance at the bar! Stephanie with the Happy Planner giveaways! 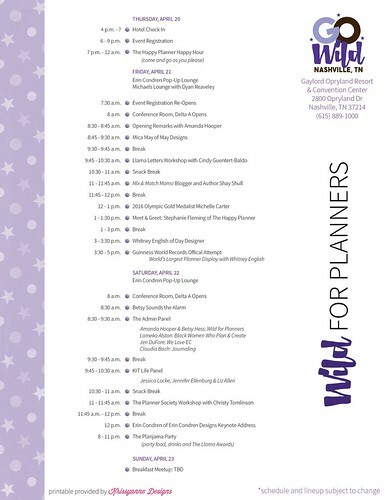 Also, everyone who attended received a Happy Planner pin! About 10:30 pm or so, Marci and I decided to head back to the hotel. It had been a lot of fun, but we were tired and Marci hadn’t gotten anything to eat yet! Jennifer volunteered to stay until close and clean up. We snuck back into the ballroom when we returned to check on Marci’s table. It looked incredible. 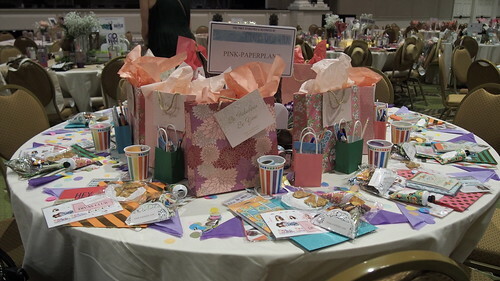 All of the table sponsors had used the time during the Happy Planner Happy Hour to decorate all the tables for Friday morning. We didn’t stay long, and I actually did not try to look at everything. I like to keep some things a bit of a surprise, even for myself. This late at night, all of the hotel restaurants were closed, as well as room service. The Conservatory Cafe (Faux Starbucks) by my room was open 24 hours, so I picked up a sandwich, coffee, and snack-size hummus and crackers. $18. Such is resort eating. My roommates, Rachel Donlin and Julia Miller, returned shortly and we went to bed. Julia and I had to be up and at the ballroom at 6:45 am for an all-hands volunteer meeting, while Rachel wanted to be up and in line (to get into the ballroom) even earlier! One of the best reason for volunteering, outside of getting to make people happy? Not having to sit in line for two hours waiting for the conference to open every morning. Truth. By the end of this day, I had over 20,000 steps recorded on my Fitbit. Buffie, I think, had the high water mark for the day, with over 25,000 steps. I should have initiated a Fitbit challenge, had I been thinking about it. I definitely would have blown my friends out of the water!